Go Healthy Life Style: Are you a NUT ? Remarkably, nuts not only taste great, but are often healthy snacks for you as well. It seems like every day more and more studies continue to be released extolling the health benefits of eating nuts as a fundamental part of your diet. The FDA has backed this up, claiming that eating additional servings of certain nuts may reduce the risk of coronary heart disease. Wow! This is great. And you thought for something to taste good, it had to be unhealthy. A nut is a hard-shelled indehiscent fruit of some plants. While a wide variety of dried seeds and fruits are called nuts in English, only a certain number of them are considered by biologists to be true nuts. Nuts are an important source of nutrients for both humans and wildlife. Nuts are a composite of the seed and the fruit, where the fruit does not open to release the seed. Most seeds come from fruits, and the seeds are free of the fruit, unlike nuts such as hazelnuts, hickories, chestnuts and acorns, which have a stony fruit wall and originate from a compound ovary. Culinary usage of the term is less restrictive, and some nuts as defined in food preparation, like pistachios and Brazil nuts, are not nuts in a biological sense. Everyday common usage of the term often refers to any hard-walled, edible kernel as a nut. Rich in energy, protein, packed with antioxidants, vitamins, minerals and much discussed omega-3 fatty acids. Crunchy yet buttery, wonderfully delicious nuts are wonderful gifts to humankind by Mother Nature. Several epidemiological studies have revealed that people who consume nuts regularly are less likely to suffer from coronary heart disease (CHD). Nuts were first linked to protection against CHD in 1993.Since then many clinical trials have found that consumption of various nuts such as almonds and walnuts can lower serum LDL cholesterol concentrations. Although nuts contain various substances thought to possess cardioprotective effects, scientists believe that their Omega 3 fatty acid profile is at least in part responsible for the hypolipidemic response observed in clinical trials. One study found that people who eat nuts live two to three years longer than those who do not.However, this may be because people who eat nuts tend to eat less junk food. Nuts contain the essential fatty acids linoleic and linolenic acids, and the fats in nuts for the most part are unsaturated fats, including monounsaturated fats. Nuts also provide Arginine, a substance that may help make the walls of the arteries more flexible and less prone to blockage from blood clot formation. Nuts are most healthy in their raw form. The reason is that up to 15% of the healthy oils that naturally occur in nuts are lost during the roasting process. Roasting at high temperatures could also cause chemicals that advance the aging process to form. Raw or unroasted walnuts were found to have twice as many antioxidants as other nuts. Although initial studies suggested that antioxidants might promote health, later large clinical trials did not detect any benefit and suggested instead that excess supplementation of antioxidant supplements is harmful. Raw nuts are rich sources of protein and healthy monounsaturated and polyunsaturated fats. These fats are essential for good health and may help lower cholesterol and protect against heart disease. According to the Kentucky University College of Agriculture, eating nuts in their raw state is preferable to eating roasted or toasted nuts, as raw nuts have more nutrients than cooked. Nuts have many health benefits and are a source of protein, fiber, monounsaturated fats, vitamins and minerals. 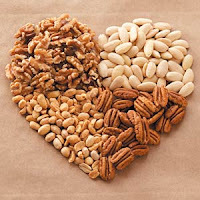 Use nuts in place of saturated fat sources like meats and cheeses for greatest health benefit. In 2003, the Food and Drug Administration made a health claim that eating 1.5 oz. of almonds, hazelnuts, peanuts, pecans, some pine nuts, pistachios or walnuts may reduce risk for heart disease when incorporated in a low saturated fat and cholesterol diet. Nuts are must! Why ? · Nuts are rich in energy and nutrients. Nuts nutrition loaded with excellent source of monounsaturated fatty acids such as oleic and palmitoleic acids, which help to lower LDL or "bad cholesterol" and increase HDL or "good cholesterol". Research studies suggest that Mediterranean diet that is rich in monounsaturated fatty acids helps to prevent coronary artery disease, strokes by favoring healthy blood lipid profile. · They are rich source of all important omega-3 essential fatty acids like Linoleic acid, α-Linolenic acid (ALA),Eicosapentaenoic acid, Docosahexonic acid etc. Research studies have suggested that n-3 orω-3 fatty acids by their virtue of anti-inflammatory action helps to lower the risk of blood pressure, coronary artery disease, strokes and breast, colon and prostate cancers. Omega-3 fatty acids also offer some benefits in conditions such as rheumatoid arthritis and in cases of Schizophrenia, depression and Alzheimer’s disease. · Nuts are storehouse of health benefiting poly-phenolic flavonoid antioxidants such as carotenes, resveratrol, lutein, cryptoxanthin etc. These compounds have been found to be protective against cancers, heart disease, degenerative nerve disease, Alzheimer's disease, and viral/ fungal infections. Studies suggests that resveratrol in peanuts reduces stroke risk by alteration of molecular mechanisms in the blood vessels, reducing their susceptibility to vascular damage through decreased activity of angiotensin (a systemic hormone causing blood vessel constriction that would elevate blood pressure) and increased production of the vasodilator hormone, nitric oxide. 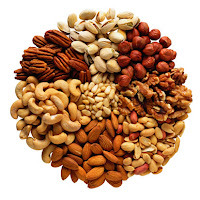 · Nuts nutrition is total in the sense that in addition to calories, vitamins they are rich source of minerals like manganese, potassium, calcium, iron, magnesium, zinc, fluoride and selenium. Manganeseis a co-factor for the enzyme superoxide dismutase, which is a very powerful free radical scavenger. Potassiumis an important component of cell and body fluids that helps controlling heart rate and blood pressure. Copper is required for the production of red blood cells. Ironis required for red blood cell formation. Fluoride is a component of bones and teeth and play important role in prevention of dental caries. · They contain very good levels of vitamin-E, a powerful lipid soluble antioxidant. Vitamin E is required for maintaining the integrity of cell membrane of mucus membranes and skin; thus, protecting it from harmful oxygen free radicals. · Nuts nutrition provides many vital B-complexgroups of vitamins such as riboflavin, niacin, thiamin, pantothenic acid, vitamin B-6, and folates. These vitamins are essential for optimum health and wellbeing. There are dozens of types of nutsout there. Don’t get caught up eating just one type of nut. Roasted nuts aren’t nearly as healthy as raw nuts. And it’s always best to get the unsalted variety when possible. While nuts are a healthy food, don’t go overboard. A handful of nuts at a time is about the right amount. Nature's friendly! Almost all the varieties of nuts we eat come in safe envelopes (shells). There is nothing to worry about contamination or handling issues. Just grab healthy looking nuts of your choice and enjoy ! Enrich your diet with nuts nutrition! Just munch a handful of nuts a day and you will be doing more than good to keep yourself healthy and stay fit.